Facebook Messenger by Crisp App combines two services that many of us hold near and dear: Facebook chat and VoiP. The app aims to one-up Facebook’s existing chat service by adding its own free VoiP service to the mix, making it easy to engage in voice chats with your Facebook friends free of charge. When you log into your Facebook account through Facebook Messenger, you’re presented with a list of your online friends. 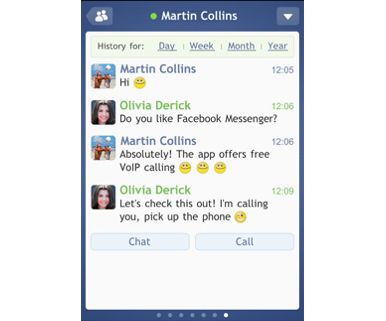 You can proceed to chat with a friend via text, or if the friend is also running the Facebook Messenger app on their phone, you can connect for a free VoiP chat. If your friend is using Facebook on their computer, Facebook Messenger will send them a link that takes them to a Website where they can speak with you via a Flash-based VoiP app. Facebook Messenger also lets you post pictures, browse message history, view a friend’s wall, use emoticons, receive instant replies via Push Notifications, and set up sound notifications and multi-tasking support from within the app. According to a company representative, Crisp App will eventually introduce paid plans for calling regular phone numbers as well. Facebook Messenger costs $3 and requires iOS 3.1.2 or later.